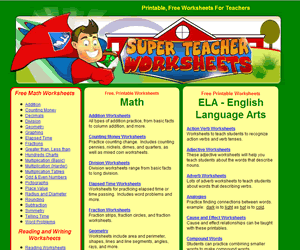 Super Teacher Worksheets is one of the most complete, high quality collections of well thought-out worksheets that I’ve come across in a long time. If that wasn’t enough, they’re also free! Math, reading, writing, grammar, phonics, spelling, science and social studies worksheets are well organized, which means you won’t be wasting time trying to find what you want. Each also comes with its own answer key. Since there are numerous variations for each subject, it should be easy to find the perfect way to present material to your students. Here is a sample worksheet for counting coins. Clearly, these worksheets aren’t just thrown together. There is a lot of meat on these bones. You simply must go check this out. Now!